Decline & Recovery of the Bald Eagle. © American Eagle Foundation. How many Bald Eagles once lived in the United States? How did Bald Eagles become endangered? For a long time, eagles were shot on a regular basis because they were a perceived threat to livestock and the salmon population. Bounties were given for eagle carcasses. By 1940, the decline of Bald Eagles compelled Congress to pass the Bald Eagle Protect Act, which outlawed the killing and disturbing of eagles, as well as the possession of eagle parts, including feathers, eggs, and nests. After the insecticide DDT was used extensively after the mid 1940s, Bald Eagle populations declined catastrophically. DDT caused the eggshells to become so thin that they would easily break. By 1963, only 417 nesting pairs were found in the lower 48 states. DDT was banned from use in the United States in 1972 and in Canada in 1973, making it possible for recovery programs to be successful. – BH, National Geographic. What effect did the book "Silent Spring" have on Bald Eagle Recovery? Silent Spring is an environmental science book written by Rachel Carson and published in 1962. The book documented the detrimental effects on the environment—particularly on birds—of the indiscriminate use of pesticides. Carson accused the chemical industry of spreading disinformation and public officials of accepting industry claims unquestioningly. In the late 1950s, Carson turned her attention to conservation, especially environmental problems that she believed were caused by synthetic pesticides. The result was Silent Spring (1962), which brought environmental concerns to the American public. Silent Spring was met with fierce opposition by chemical companies, but it spurred a reversal in national pesticide policy, led to a nationwide ban on DDT for agricultural uses, and inspired an environmental movement that led to the creation of the U.S. Environmental Protection Agency. – Wikipedia. How has ‘hacking’ helped restore Bald Eagles? Is it illegal to possess a Bald Eagle’s feathers? Yes. It is illegal to possess an eagle’s feathers or any parts of an eagle unless you have a special federal and state permit to do so. How has the AEF been involved with hacking and release of Bald Eagles? By the end of 2015, AEF has released a total of 145 young Bald Eagles from its Douglas Lake, TN hack site, the largest number of any hack releases in the state. AEF has assisted the Tennessee Wildlife Resources Agency and other partners in the hacking of hundreds of other eaglets. Many eaglets that have been released from AEF’s hack tower (banded and fitted with patagial tags) have been spotted years later by people as far away as the Great Lakes. Read about ‘Lady Independence,’ the released eaglet that came back to Tennessee! When was the Bald Eagle Listed as Threatened & Endangered? 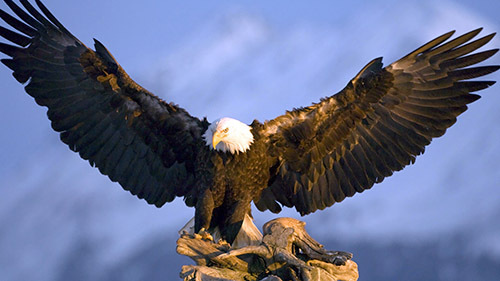 Bald Eagles were listed as Endangered in 43 of the lower 48 states from 1967 until 1995. They were listed as Threatened in all lower 48 states from 1995 until 2007 when there were over 10,000 Bald Eagle pairs int he lower 48 states. – BH, updated by AEF. 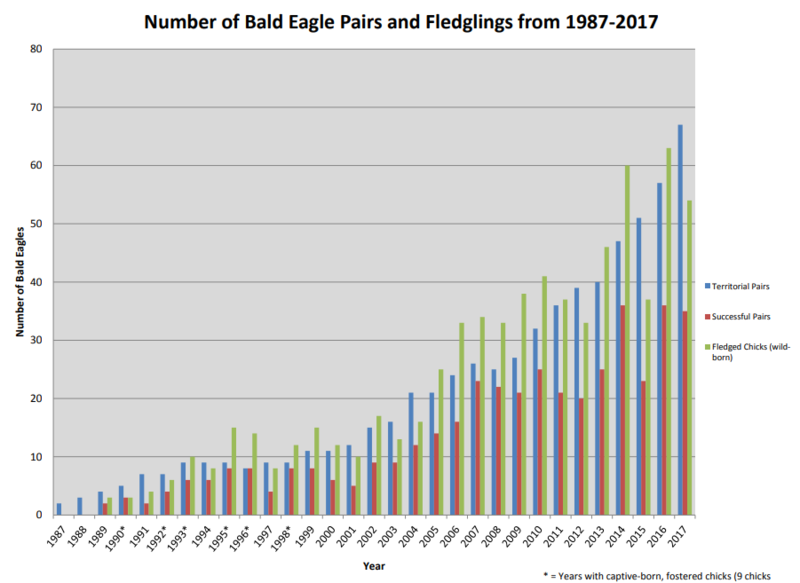 How have bald eagle numbers increased since 1963? At the lowest recorded point (in 1963), there were only 417 nesting pairs of Bald Eagles in the lower 48 states. By 2007 that number had grown to 10,000, which prompted the removal of the Bald Eagle from the Endangered Species list. Estimates for the current number of Bald Eagle nesting pairs in the lower 48 states are now at 14,000 – 15,000. As of 2016, states with the largest population of nesting Bald Eagles are Minnesota and Florida. When was the bald eagle delisted from threatened & endangered? On June 28, 2007, Secretary of the Interior Dirk Kempthorn announced the removal of the Bald Eagle from the list of threatened and endangered species at a ceremony at the Jefferson Memorial in Washington, D.C.
Bald Eagle Challenger and AEF president and founder, Al Cecere, participated in the delisting ceremony. At one time, New Jersey was home to more than 20 pairs of nesting Bald Eagles; DDT reduced that number to one pair by 1970. The ban on DDT and efforts by biologists with the NJ Division of Fish & Wildlife’s Endangered and Nongame Species Program has effectively restored the Bald Eagle to 150 pairs by 2015. By clicking this link, an interactive webpage will open whereby you will be able to track New Jersey Bald Eagle Nests over the years. An article from the New Jersey Monthly, The Last Nest: Saving Our Bald Eagle Population, tells the complete story on restoration efforts, including the story of NJ’s very successful hacking program. This is a video produced by the Delaware Highland Conservancy about why the eagles returned. Narrated by Peter Nye (Wildlife Biologist) and Sue Currier (Delaware Highlands Conservancy Executive Director), it dramatically tells the story of the comeback of the Bald Eagle in New York and surrounding states. In 1972, there was a single pair of nesting American Bald Eagles left in New York state. 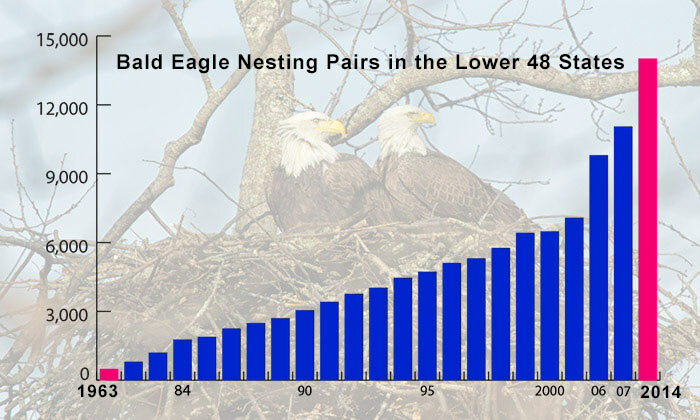 By 2014, the number of nesting Bald Eagle pairs had grown to about 600 pairs in New York and Pennsylvania combined. The story of the American Bald Eagle’s return teaches us about the impact we have on our environment, and our responsibility to conserve our shared habitat. In Massachusetts, the Bald Eagle Population is Soaring! Before conservation efforts began, the last Bald Eagle nest in Massachusetts was recorded in 1905. In 1989, scientists started to seed the state’s population. In the last few years, the breeding population of Bald Eagles in Massachusetts has rapidly increased to a record high, according to state ornithologist Andrew Vitz. In 2017, the state had 68 territorial nesting pairs, nine more than the year before. Read the entire article.